The Cleveland Cavaliers need to make a trade. There are a few big names that the Cavs could bring in, especially if any trade could cost them a big piece to their team. The Cleveland Cavaliers have a conundrum (hint) that they will need to address eventually. In order to receive value in a trade, you have to give up value. That means that the Cavs need to trade a player that they wouldn’t want to give up in order to acquire the type of player or talent that they need. In making that trade, it’s likely that the team will be negatively impacted on an emotional level. Sure, this is the NBA and players that get traded know it’s a business first, just like their former teammates know. Still, if Iman Shumpert is traded that’ll definitely dampen the spirits of everybody in the locker room. The best hope for general manager David Griffin is that the new guy fits in seamlessly. Last year, Anderson Varejao was traded in a surprising three-team deal that included the Orlando Magic and Portland Trail Blazers. While the team and fans were saddened by Varejao being traded, Channing Frye came in and fit seamlessly with LeBron James and Richard Jefferson. That’s the type of trade the Cavs need now. Here are three players the team should try to trade for in the absence of J.R. Smith. Brandon Knight is a quick-twitch player with a knack for high-scoring games because he thrives as a catch-and-shoot player. The University of Kentucky product is also great at generating assists for an offense as he consistently collapses the opposing team with his quickness and ball-handling. Knight, who has experience at both guard positions, could fill in as a starter until Smith returns while still manning the point guard position in the second unit. The addition of Knight would cost the Cavs a defender in Shumpert that will be a big benefit to the Phoenix Suns. Nonetheless, he’s like Smith and backup point guard rolled into one player. While giving up Mike Dunleavy Jr. would also help the Suns, Cavs fans should’t worry about the two-for one deal. With the talent of Knight, they can run a nine-man rotation until Smith returns. In the meantime, Dahntay Jones might also get a call. Tyreke Evans is a versatile player who can play all three positions on the perimeter but operates like a combo guard. With the ball in his hands, Evans is a true triple-threat and able to drive, shoot or pass. For the Cavs, Evans fits well with the starting unit. On the bench, Langston Galloway is a confident shooter and has the combination of ball-handling and court vision that will allow him to set up the three-point specialists in the second unit. That unit won’t include Shumpert, who the Pelicans can start between Jrue Holiday and Buddy Hield, or Dunleavy Jr. who can provide a Ryan Andersen-like impact for the Pelicans. 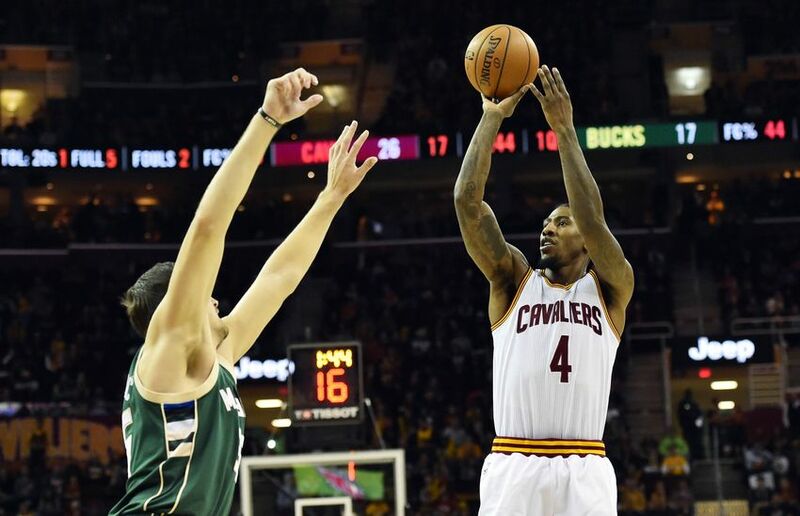 With Evans on an expiring contract, Shumpert’s strong season, the pedigree of Shumpert and Dunleavy Jr. and the Cleveland Cavaliers first round draft pick, the Cavs have a good chance to knock out two birds with one stone in this trade. Here is a trade that may catch some by surprise. On the one hand, it seems unlikely to benefit the New York Knicks. 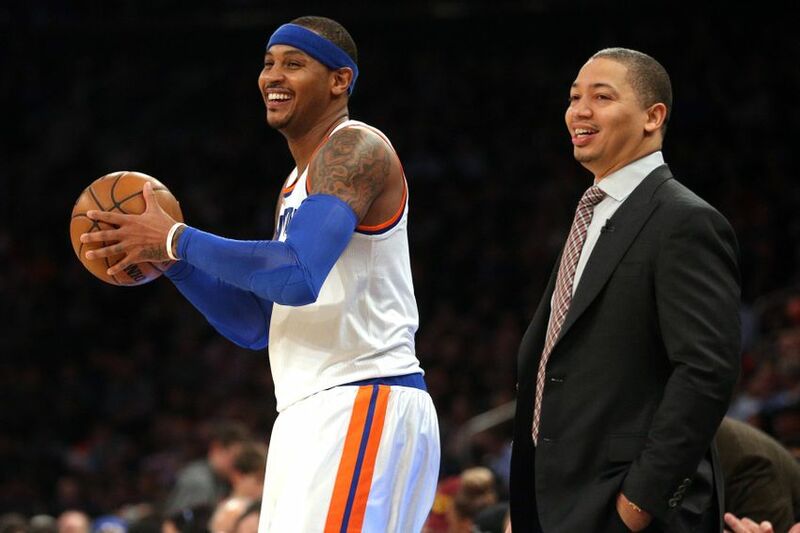 On the other hand, Carmelo Anthony‘s arrival could mean James playing shooting guard, nominally. In reality, it will be more position-less basketball than anything. James, Anthony and Kyrie Irving would all be playing roles that made them interchangeable as ball-handlers, floor spacers and slashers. 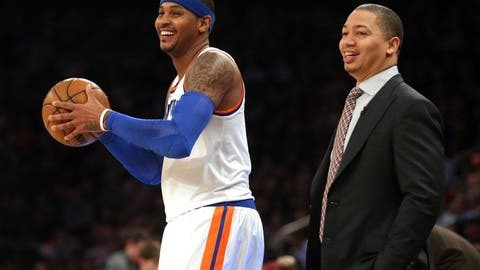 Unfortunately, the Cavs would have to give up four players to acquire Anthony and the New York Knicks wouldn’t give Anthony up for that trade package. What’s more likely, with the current Knicks falling short of being championship contenders, is that the Knicks want to trade Anthony and rebuild around Kristaps Porzingis. Trading him to the Cavs as they acquire young pieces like Will Barton and Kenneth Faried from the Denver Nuggets makes sense as the Nuggets can acquire Shumpert, Brandon Jennings and Jordan McRae from Cleveland in a three-team deal that could possibly leave them with Jameer Nelson as well. Too far-fetched right? If only the New York Knicks thought that the only way to stop the Golden State Warriors was to create an equally talented superteam in the East that was older and more vulnerable but just young enough to dismante a potential Bay Area dynasty. That way, the rest of the league could fight for the crown around the 2020 season, when the new batch of NBA superstars and legends emerge. That’s Zen Master levels of manipulation right there. The Denver Nuggets are simply a better team with Shumpert amd Jennings playing in place of Barton and Faried. Shumpert is consistently mentioned as the Cavs biggest trade piece because he is, if the Cavs want a valuable return. With Mo Williams out, and likely to be bought out of his contract instead of traded, and McRae having diminished his trade value with consistent poor performances all season, the Cleveland Cavaliers will have to sacrifice their future pieces (a 2017 first round draft pick, draft rights to Cedi Osman) in a trade. Even then, those players are unproven, have no contractual value and the Cavs don’t want to trade away their opportunity to bring in young talent. Next year, Kay Felder, McRae, Osman and the future first round pick could be in line for rotation spots as Jefferson and James Jones get set for retirement. James and Frye will be another year past thirty and Kevin Love will be approaching thirty years of age soon. Ultimately, a player like Shump is the only realistic trade piece the Cavs have that will help them improve significantly. The 36-year-old Dunleavy Jr. isn’t a player a lot of teams would want in exchange for a player that could help their team. Griffin may work his magic one more time, getting the team a valuable player while keeping Shumpert, Dunleavy Jr., or both. Could the Cleveland Cavaliers pull off one of these trades? Let us know in the comments section or Twitter @KJG_NBA.